It is time for a new update! This week it’s time to celebrate an amazing milestone we reached last week. Additionally, we’re updating you about the final shipments. 1 million (!) raised on Indiegogo! Our campaign funding counter hit the 1 million last week. We are SO happy! Thanks a lot for the amazing support, trust and patience during this campaign. You are the foundation of the success of Ockel Computers. Without you, we wouldn’t be where we are today. Because of you we got the chance to grow, learn and produce. 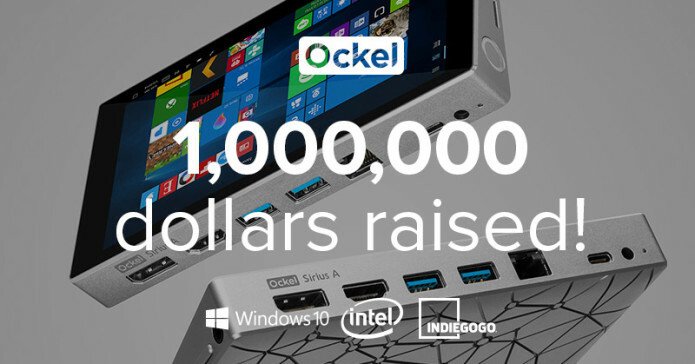 Everything we do here at Ockel is related to one thing and one thing only: our mission to Reinvent the PC. You were and you still are a part of Ockel Computers and this campaign, you are part of the journey and you are part of this piece of history, our piece of history. Thank you, a million times. We have shipped a few Ockels this weekend and the remainder will be shipped in the coming two to three days. Keep a close eye on your email inbox for the tracking information email. As you all know, we are using DHL Express which means that you will receive your Ockel before the end of this week. Currently the main priority is to ship out the backorders we currently have, here on Indiegogo. The next step is to fulfill the orders we have gathered on the Ockel Webstore. We expect not to have enough stock to fulfill all existing backorders at this time. We’re doing all we can to secure additional production models before Chinese New Year, however cannot guarantee this at this moment. Obviously, this situation does not affect any Indiegogo backer.